Hello from the Caribbean! Yes, it’s that time of year, when Macworld editors write about what's going on at the latest MacMania cruise —where dozens of Mac users (but not you) are mixing a fantastic, exotic vacation with the latest and greatest Mac info from a team of expert speakers. This installment, MacMania 7, is a 10-day cruise in the Caribbean aboard the MS Volendam with the highlight of the trip being a passage into the Panama Canal. I say into and not through there because this isn’t one of those two-week, start in San Diego, end in Florida type itineraries. Instead, we depart and return to Fort Lauderdale, Florida. But in between those two stops, not only do we pass into Gatun Lake in the center of the Panama Canal, but we visit numerous Caribbean destinations. Being mindful of the fact that the calendar is slouching toward the holidays, I have to point out that it seems to be 80 degrees and sunny everywhere we go. Today I met a guy from Chicago who pointed out that temperatures were in the 40s when he left home—good timing. 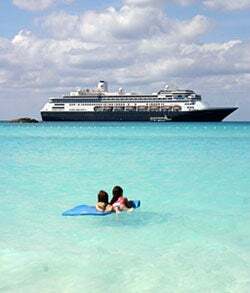 The Volendam is anchored off Half Moon Cay, Bahamas. As I said, we departed from Ft. Lauderdale on Saturday, with dozens of MacMania conference participants, not to mention the additional family members they brought along with them. (I’ve done that, too—my wife, kids, and parents are aboard for this one.) The speakers on the cruise include myself, New York Times (and as I must always point out, former Macworld ) columnist David Pogue, photo expert Derrick Story, longtime Mac author Robin Williams, and two fantastic speakers who work at Apple, AppleScript maven Sal Soghoian and iLife expert Janet Hill. We’ve also got an Oscar-winning actor aboard as both a conference attendee and a speaker, but I’m going to milk that little piece of information for all it’s worth, so check back later for more. Monday was a “sea day,” and the way these conferences work is that MacMania is in session when the ship’s not in port. So on a sea day, there’s a full load of sessions, as well as the Ingenious Bar, a hang-out for cruisers and speakers to shoot the breeze. Monday Sal Soghoian and I spent a couple of hours in the Volendam’s Piano Bar with cruisers, talking about what Apple’s going to be up to next (it’s fun to engage the Pure Speculation Engine and let ’er rip), the travails of would-be iPhone buyers in Canada and Puerto Rico, and the stupidity of Hollywood studios in failing to embrace the digital revolution. Neil Bauman of InSight Cruises, co-producer of Mac Mania, addresses conference attendees before Jason Snell’s “Leopard 101” session. 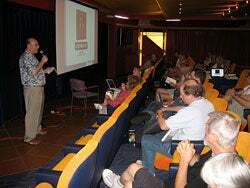 Just before dinner, it was time for the featured presentation in the ship’s movie theater. And in the case of MacMania, that meant me. I spent two hours with a receptive audience giving a “Leopard 101” presentation, going over the highlights of the new operating system, demoing some of the cooler features, and answering questions about what Leopard can and can’t do. The turn-out and activity of the audience was even better than I expected, considering that I learned early on that the majority of MacMania cruise-goers have—surprise surprise—already bought Leopard. I hope I uncovered some features that they hadn’t had time to discover for themselves, at the very least. On Tuesday, after a few morning Mac Mania sessions, the ship docked at the island of Aruba, a Dutch possession just 20 miles off the coast of Venezuela. Aruba is a tourist destination, and I can see why. It’s got long, beautiful beaches and sunny, warm weather. I’m glad my kids like to play in the sand and surf, because that meant that all of us got to spend a fantastic afternoon at Aruba’s Eagle Beach, bobbing in the water and building (and demolishing, my three-year-old’s favorite part) sand castles on the beach. All the while, all of us Mac types have been able to stay in contact with the outside world if we so desire. The ship has satellite-based Internet, which is slower than broadband, but serviceable. And all of us discovered, to our surprise, that Holland America is apparently being aggressive in adding Wi-Fi hotspots to the ship. Although the Wi-Fi signal is supposed to be limited to a few specific areas of the ship, everyone I’ve talked to has said that they can receive a Wi-Fi signal in their staterooms. I definitely can, which allows me to quickly log in and send off e-mails (and dispatches like this one) without hiking up to the ship’s Internet Cafe. Anyway, that’s my report as of now. Forthcoming on MacMania 7, we’ll be visiting the island of Curaçao, cruising the Panama Canal, and visiting the Caribbean coast of Costa Rica, before returning to Florida. Stay tuned for more updates on the goings on, along with (if the multimedia gods are with us) a Macworld Podcast segment and a Macworld Video installment. MacMania 8, produced by InSight Cruises and Macworld, is coming next November. Mac Mania 8 is sailing to the Eastern Mediterranean, including Italy and Egypt.